The entire text is in English with the captions bi-lingual. Profiles are all interesting and include a G-2 in RLM 70/71/76. I find this series not quite as interesting as the Monograph series but still quite good with reasonable profiles. Kagero’s Air Battles Series covers campaigns rather than aircraft or pilots and does not have the free decals or masks as in other series. 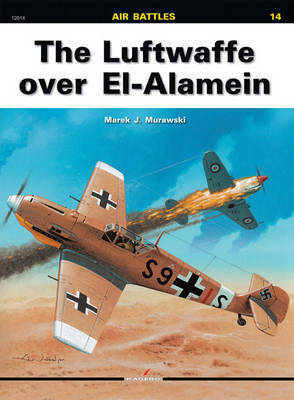 This one, number 14, “The Luftwaffe over El-Alamein” as the name suggests covers the Luftwaffe’s actions in North Africa in 1942. At only 58 pages, it’s not as thick as some of the other titles and only has 5 chapters including the Introduction, Rommel’s Offensive and the British Counterattack, Calm before the Storm, Montgomery Attacks and Retreat. Entirely in English, well written and easy to understand, the text is accompanied by many period black and white photos, most are from the DAK side of things and some are of German wrecks. At the end of the book, the last 4 pages plus the back cover contain the 9 side profiles from JG27, ZG1 and JG77. Of special interest is a G-2 from JG77 in the unusual scheme for the period and the model of RLM 70/71 over 76 with a patch of RLM 80 on the rear fuselage. On the back cover is Marseille’s last F-4, 8673, always a popular subject in these books. Well worth the price for a good read, interesting photos and excellent profiles.